Yurts, glamping, tiny home camping—you’ve done all that, and it was great. But for a woodsy retreat that literally sweeps you and your honey off your feet, it’s hard to argue with an adult-sized treehouse. If that sounds like a childhood dream too good to be true, count your blessings: this is the Pacific Northwest, and we definitely build amazing stuff way up in trees. 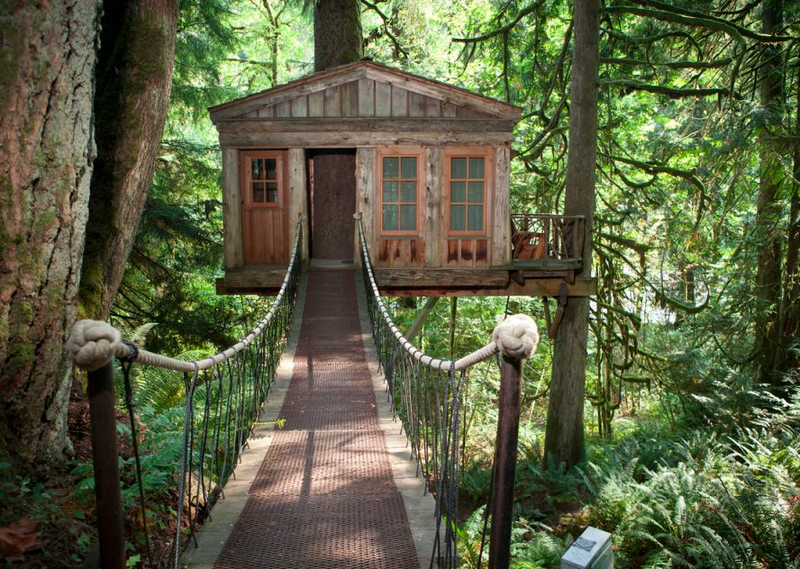 Some of these lofted lodgings are Peter Pan-perfect. Others—with swinging bridges, floor-to-ceiling windows, even kitchenettes—are probably more luxe than your original Lost Boys fantasy. Find your match among the five fabulous aeries listed below, but remember—you’re not the only couple angling for a bird’s eye view. If you want to book these nests, check soon! You can explore this six-cabin resort (also with a rentable main lodge) on their website. Sashay your way across a swinging bridge into this river-overhanging treehouse, Temple of the Blue Moon. Rate: $365/night for two. Just one guest cabin is available on this property tucked into Mt Rainier National Forest. Set 50 feet up in a 200-year-old tree, this romantic two-person treehouse delivers the views of a lifetime—Gifford Pinchot's old-growth forest, the undulating Sawtooth Range, Mt Rainier's snow-capped peak. For reservations, call Bill Compher at 360-789-6773. Learn more on this website. 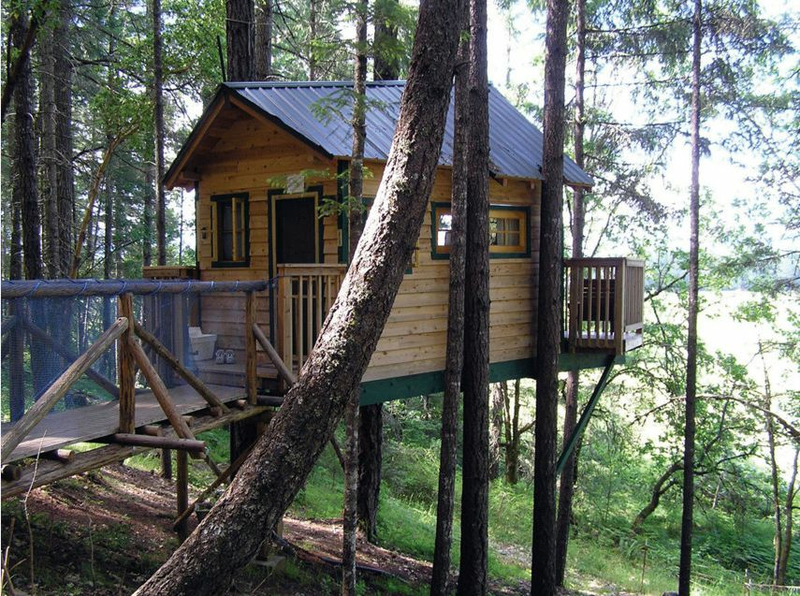 Guests can book three treehouses within this secluded Doug-fir forest, like the Cottage Tree House (pictured above). You can’t cook here, but you can enjoy the view! 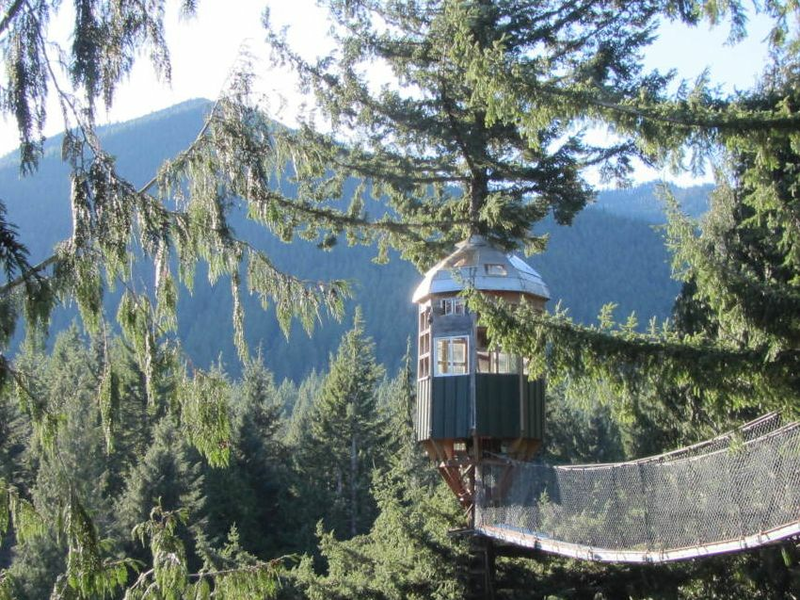 Sleeping two people, this treehouse resort not far from Oregon's southern border includes breakfast and costs $280/night. Check out things to do while you stay there and make reservations here. Five treehouses on this structure-studded property are available to overnight guests. 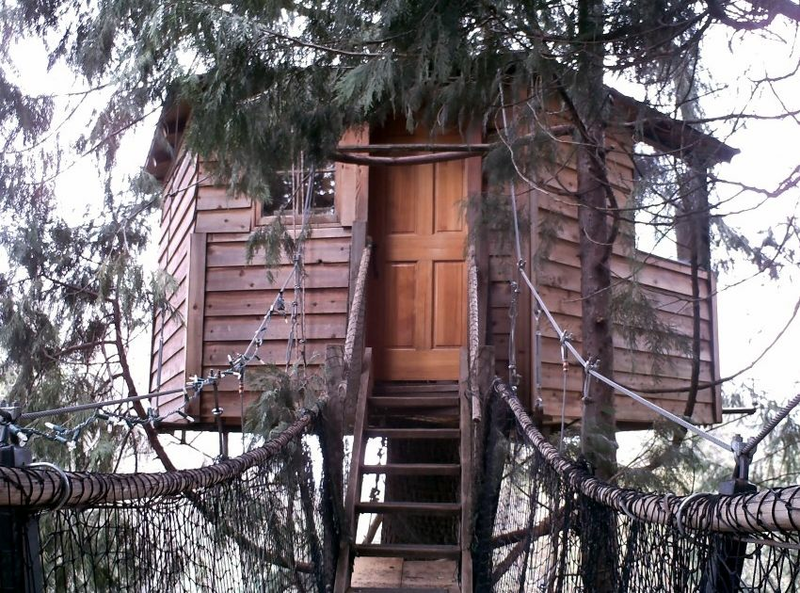 Make reservations and explore more of their tree houses on their website, like the Forestree property (pictured above). Navigate a swinging bridge up 35 feet in the air and you'll find electricity, a restroom, and built-in tree-hugging—the actual tree that holds up your home juts right through the building. Rate: $280/night for four people. 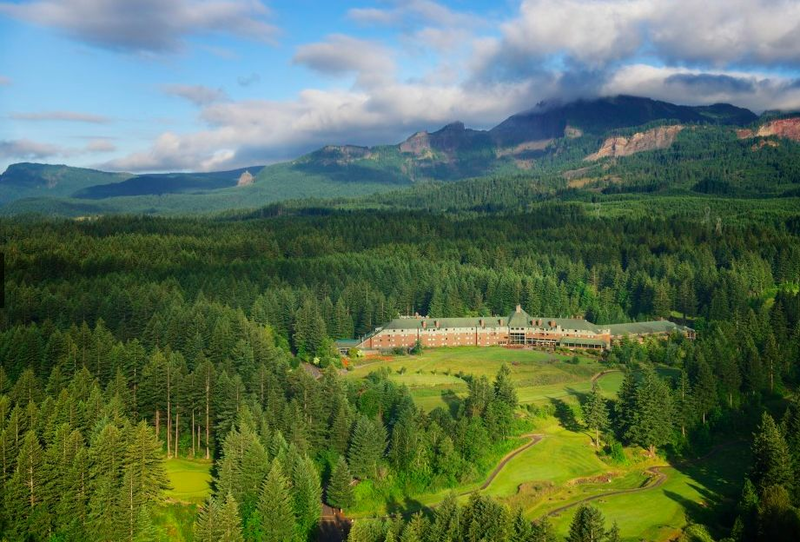 Skamania Lodge is jumping on the treehouse bandwagon too! Well, sort of. Starting September 1, the historic Gorge property will offer two treehouse cabins on the south side of their property. 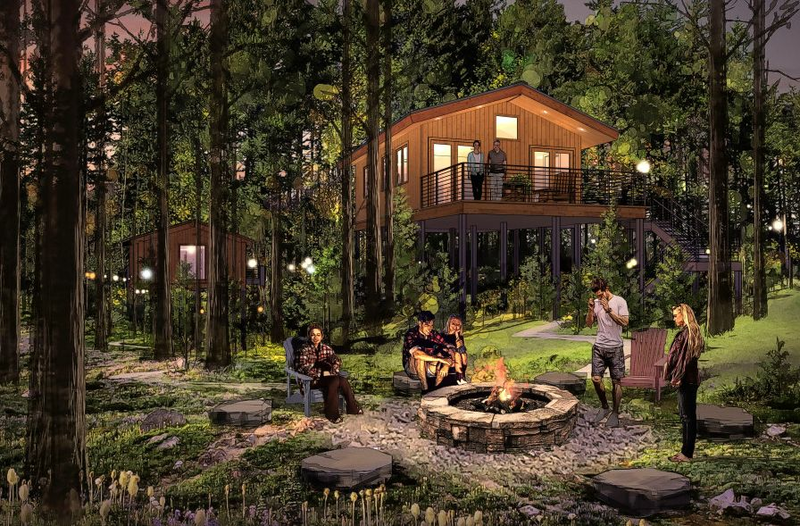 They'll look something like this rendering, say hotel reps. *Okay, so Skamania's two "treehouses" are really just lovely lodges on stilts surrounded by trees (if you want to get technical about it), and they won’t sit terribly high in the sky. BUT, there are other ways to enjoy the view, like on the resort's zip-lines. Book lodging and preview the amenities here.